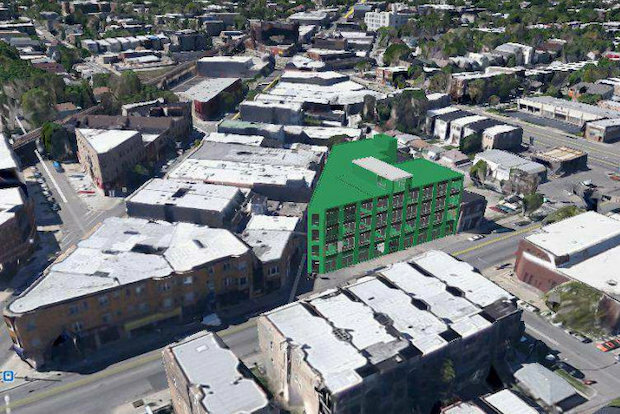 LOGAN SQUARE — A controversial "micro apartment" building plan in Logan Square will get another review from residents this week, but some are peeved about what they call a "closed door" meeting with developers and a neighborhood group. The five-story building proposed for 2340 N. California Ave. has been downsized from 63 to 56 rental units following a meeting between Savoy Development and the Greater Goethe Neighborhood Association (GGNA) on August 11, which was done “behind closed doors,” said another neighborhood group, adding that a public notice typically sent by the association ahead of each meeting never came. Residents will have a chance to sound off on the revised proposal at a community meeting on August 27, according to Ald. Joe Moreno (1st). But community residents and members of Logan Square Preservation, including Paddy Lauber, said the unannounced second review should have also been made public due to the development’s location and potential impact. More than 120 people showed up to a contentious April meeting, raising questions about the large upzoning request, parking and overall density at the busy intersection. GGNA president Sally Hamann did not return calls for comment, but Moreno said meetings between zoning subcommittees and developers are common. Developer Enrico Plati said the recommendations presented during his “last minute meeting” with the zoning committee on August 11 are all “fairly minor” changes that he can accommodate. The six recommendations referred to Moreno's office by the zoning and planning committee include a height restriction and a request for green roofing plans. The next community meeting on the proposal will be at Haas Park, August 27, at 6:30 p.m., according to Moreno.